For the couple that loves the outdoors together, these unique camo wedding rings his and hers sets represent your unique bond. Most camo wedding ring options on the market aren't shown together as a set but when ordered in standard widths for men and women, you can create your own custom matching set that is not only one of a kind but really special. Most women's camo rings are in 5mm and 6mm, while mens rings range from 6mm to 10mm (and sometimes wider). Talk with your camo rings retailer about a custom order because most all camo rings can be custom ordered in whatever width you want. This classy His and Hers matching camo ring set is made with super durable, scratch-resistant, and hypoallergenic Cobalt Chrome. His ring is an 8 mm band inlaid with 5 mm of camo and is domed with a grooved edge. Hers is a 5 mm band inlaid with 3 mm of camo and has a domed profile. Both will fit comfortably and the camo will contrast nicely to the camo pattern of your choice. Shown in King's Mountain Shadow camo. There’s nothing more that says “Hey, we are livin’ breathin’ bona fide Southern souls” than matching rings made of Black Zirconium with licensed camo inlay and a .05 carat diamond in the middle of each ring. Hers is a 5mm thin band with a 3mm camo inlay and his is a 7mm wide band with a 5mm camo inlay. You are free to pick the pattern for your King’s Shadow camo inlay. You’ll love this gorgeous set of rings that are forged with Cobalt Chrome. Shown in King’s Woodland Shadow, His ring is an 8 mm band inlaid with 4 mm of camo and Hers is a 6 mm band inlaid with 3 mm of camo that sports a brilliant .25 carat diamond. Both have flat edges and are guaranteed to fit comfortably. 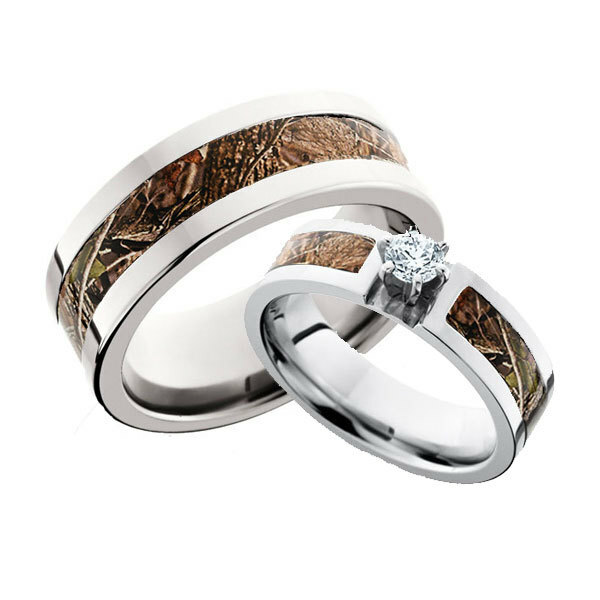 If you’re a camo lovin’ outdoorsy couple who wish to tie the knot, you'll definitely want gorgeous rings that speak of your love for each other and for the outdoors. So don't hold back, show what's truly in your blood!